Compiled by Barbara Paulding. Illustrated by Martha Day Zschock. A Bedtime Shadow Book. Tuck little ones under the covers and set sailf for the Land of Nod with this bedtime collection of beloved nursery rhymes. 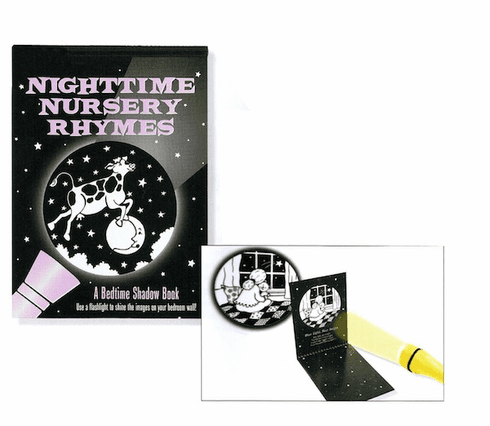 Shine the beam of a flashlight (not included) through 6 transparent page "windows" to cast silhouette pictures on the wall as you bring favorite verses to life, including "Twinkle, Twinkle Little Star," "Hey Diddle, Diddle," and "Sleep Baby Sleep." Ages 3 -9.